Making meal times more fun! Peel and cook the potatoes in boiling salted water. Mash the potatoes and mix with the egg, chopped parsley, chopped chives, salt and pepper. Cut the hotdogs in half, then split them lengthways 3/4 of the way along. 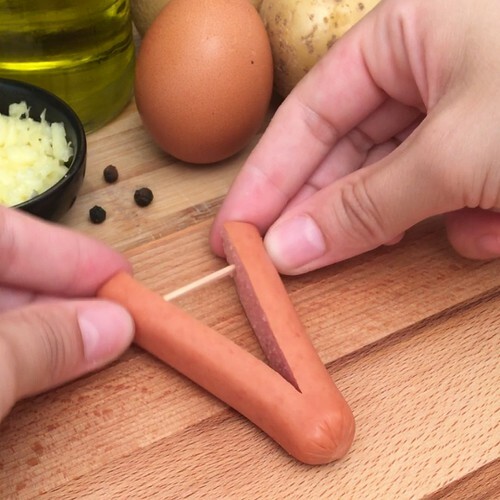 Push a toothpick through each hot dog piece, and spread the sausage to make a “V”. Place the sausage pieces in star shapes on a lined baking tray. Fill the middle of each star with the mashed potatoes, and sprinkle with grated mozzarella on top. Bake for 10 minutes at 180 °C. Remove the toothpicks and enjoy warm with salad on the side.